The English countryside has plenty to offer keen walkers and holidaymakers. It is sprawling with rolling green hills, rugged mountains, picturesque landscapes and dramatic chalk cliffs. With secluded woodlands and a far-stretching scenic coastline the English countryside has it all. In order to preserve it however, all explorers must be aware of, and follow, countryside etiquette. There are around 140,000 miles of off-road routes to explore throughout England and Wales. These are known as Rights of Way. 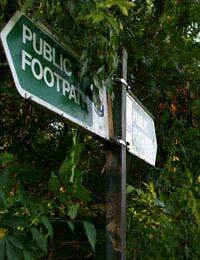 Maintenance and protection of these pathways and areas is the responsibility of the local authorities. These routes are easily accessible if you follow an Ordnance Survey Explorer or countryside map. The Rights of Way, by law, cannot be diverted or closed and must remain unobstructed at all times. If a walker encounters a path that is blocked by overgrowth, barbed wire or general poor upkeep of a gate or stile, they are entitled to find an alternative route, if they are not able to remove the obstruction. The walker should then report the obstruction to the Rambler’s Association - their aim is to keep the countryside accessible to all and they will take this up for you. Respecting the countryside means leaving it in the same condition, or better, than you find it. This means respecting a landowner or farmer’s rules, regarding the opening and closing of gates. A gate may be closed to control livestock, or open to allow the animals access to food and water. It is therefore important to pay attention to how you find gates and to ensure they are left in the same way they are found. Many ramblers like to take dogs on their countryside exploration and dog walking is a popular pastime along the English country paths. Keeping dogs under close control is obligatory at all times. When walking near to livestock and farm animals dogs must also be kept on a short lead. In some areas – like land where lambing takes place – dogs may be banned. Allowing your dog to foul a public area is considered an offence, so you must also clean up after your pet and dispose of the mess in an appropriate manner. Always check signs before setting off for a country walk with your dog. Information regarding walking restrictions is available from the Countryside Agency, which provides details about safe walking with your dog. The protection of animals, birds, trees and plants is a walker’s responsibility. Littering and leaving leftover food is not only damaging to the beauty of the English countryside but also poses a potential hazard to wildlife and farm animals. All walkers must therefore ensure they take all litter home with them.